All the resources you need in one place. Milgard can help you find the solutions you need. Milgard® offers a diverse product portfolio of wood, vinyl, fiberglass and aluminum windows and patio doors that can satisfy multiple price points and any type of architectural design. With custom made-to-order options and an extensive selection of styles, colors and frame options available, Milgard is here to help reflect your vision. View comparison charts to select the best product for your project. Download our selection of BIM models for AutoCAD, Revit and Sketchup files. Research our Architectural Manuals for dimensions, drawings and sizes. Use our Energy Calculator to determine which products meet u-factor, SHGC, and VT energy requirements by region, including California Title 24 Code requirements. Milgard is proud to be an ENERGY STAR® partner and offer products that meet or exceed ENERGY STAR® requirements in the areas we cover. SmartTouch® hardware epitomizes universal design by coupling an elegant look with superior usability and ease-of-use. 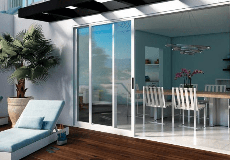 Milgard offers ADA compliant doors with our Ultra™ Series in swing and out-swing patio doors. Sliding glass doors with high quality rolling systems also make it easier to open and close the door. Your single source for product details and min/max sizes, BIM models, and ratings. We offer live presentations and easy-to-access courses you can take online, any time. Use the Milgard Energy Calculator for a quick and easy way to select windows and patio doors that meet local energy code requirements. Learn how Milgard products can help earn LEED v 4 credits for Green Building Practices. Need assistance? Reach out to one of our architect representatives to answer any questions. Get the latest window and patio door industry information, new Milgard product releases and more.